I was influenced in the art of stained glass from my mother. I remember being young and watching her create such beautiful works of art. She always encouraged me to pursue art and gave me the freedom to explore any and every medium. She taught me the stained glass technique and encourages me to this day to continue to be creative. I graduated from York University with a Bachelor of Fine Arts Degree majoring in Oil painting and sculpture but my passion turned into Stained Glass and its endless possibilities. I try to create items using traditional methods in a non-traditional way to bring stained glass into a modern "fun" art form. Everyone has a connection to stained glass and a story, and I feel blessed to be a part of it. I hope you enjoy my art as much as I have enjoyed creating it. What is moxnme? 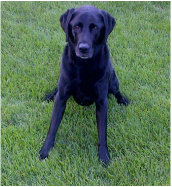 (pronounced Mox & Me) is a reference to my faithful black lab and side kick Moxie. She is always with me when I work in my studio she gives me inspiration & unconditional love!